Chapel Hill police chief Chris Blue says his department warned UNC police in advance about pro-Confederate demonstrators who illegally brought firearms onto campus last weekend. The incident took place on Saturday, March 16. At least one demonstrator had a handgun, in violation of a state law banning firearms on university grounds. The demonstrators left campus at the request of UNC police – but the university quickly came under fire for not arresting the protester, and UNC on Monday announced that police would make arrests in similar cases in the future. On Friday, UNC interim chancellor Kevin Guskiewicz issued an additional statement, announcing the creation of a campus safety commission and a series of conversations to promote equity and inclusion at UNC, including stronger relations between university police and the campus community. In an update to Chapel Hill Town Manager Maurice Jones on Wednesday, Chief Blue said a CHPD officer encountered the demonstrators in the Wallace Parking Deck and informed them that it would be illegal to bring firearms on campus. Another CHPD officer notified UNC police of the demonstrators’ presence. 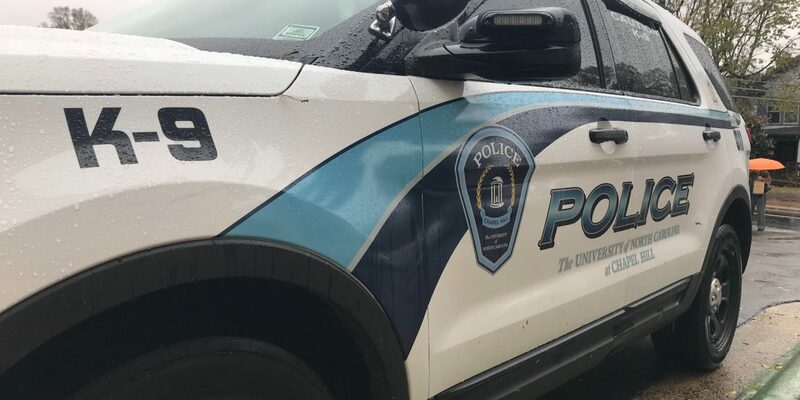 Because it’s legal to carry firearms off campus, Chapel Hill police didn’t make any arrests – but Chief Blue said CHPD officers did monitor the group until they dispersed later that afternoon. Saturday’s incident has reignited criticism of UNC police, as anti-racist advocates have long argued that campus police are too friendly with pro-Confederate demonstrators. Just this week, some faculty and staff members launched a new Twitter account, Unsafe @ UNC, charging that UNC’s approach has endangered safety on campus. Last week, we were monitoring for a potential demonstration on McCorkle Place for last Saturday, March 16th. Late in the week, we learned that the Heirs to the Confederacy, who had planned to be here, cancelled their plans. We were also aware that the Defend UNC group planned an event on McCorkle Place for Saturday afternoon. We made no additional staffing arrangements, given the cancellation of the Heirs group. On Saturday, March 16, around noon, a group began gathering in the Wallace Deck on E Rosemary St. A CHPD officer saw them and spoke with the 10-15 individuals, who said that they part of the “VA Task Force III percenters.” The officer asked if they expected any additional attendees and she was told that no additional members were expected. A member of the group asked the officer where the boundaries of campus were and she told them. She also noted that some members of the group were carrying firearms and she informed them of the prohibition of weapons on campus. A CHPD supervisor informed UNC Police of the group’s presence and their plans to visit campus. We called a half dozen officers back to monitor the group, should they return to Town of Chapel Hill property, which they eventually did after first going onto UNC property, apparently via Columbia Street and Cameron Ave.
After leaving campus, the group walked on the sidewalk around the 100 block of E Franklin St, followed by a handful of counter-demonstrators, until approximately 3:15PM. At no time did CHPD officers observe any illegal behavior on the part of either group. That’s a difference when the good guys brings guns the bad guys stay away from them and don’t start any thing which was wise. It’s the same old stuff people standing up for monuments that’s been there over 100 years and punks being obstructers and trying to cause trouble but when protection is present the punks stay back and whine like children. So help me on this criticism, the people that got away with breaking the law and tearing down statues want their opponents arrested for peaceful protests. That’s a police state! If either side is braking the law they need to be arrested. Enforcement of this countries laws equality is what we all need to support and strive for. Taking sides because one side can be a bigger pain to certain political politicians is a banana republic.